★★★★★ This thing is the real deal. It is amazing how much technology they have built into this drone. It takes phenomenal video, takes off and lands by itself, and can let you know when you are flying too close to something. It has a geo-fence which prevents you from flying too high in certain areas, and knows when the battery is running down and will return to you so that you don't run out of battery before it is home. It folds up nicely and is very portable. I bought it refurbished, but I couldn't tell that it wasn't brand new. ★★★★★ I started with the Spark last year. In comparison, flying the Mavic Pro is like flying a fighter jet. Its faster, a bit larger, and has a more detailed piloting system. The image quality is phenomenal and its Occusync Communication sytem is better than Wi-Fi in Urban areas. It is much quieter than the Spark and thats not even with the Low-Noise Propellers. And the Spark is quieter than the Mavic Air. Just on those two things alone makes the Mavic Pro a better Quadcopter than the Mavic Air. The Mavic Air is a great Quad, but in urban environments that signal strength becomes an issue. I'm happy I got it. The Mavic Pro is the only Aircraft you'll need, ecspecially if you only need establishing shots every once in a while. Great product. 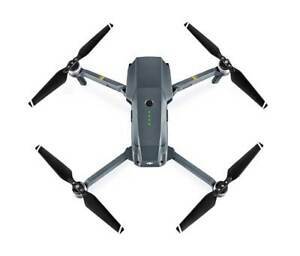 ★★★★★ Bit of a learning curve as this camera drone is feature rich. Once one learns it is easy to fly. If you can brush your teeth you can fly this drone. ★★★★★ Simply the best camera drone overall. My first was the Yuneec Q500, great camera and easy to fly until it shut off in air for an unknown reason.